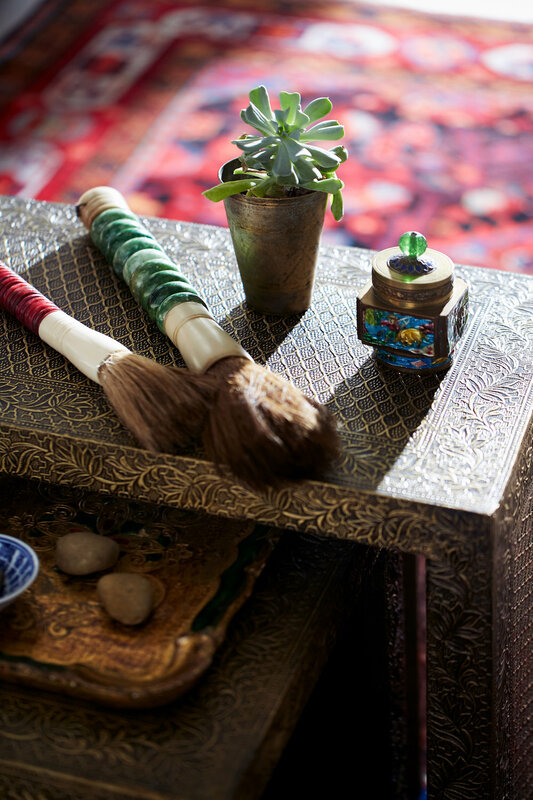 A well-traveled family looked to us to weave the themes of culture + travel throughout their home. Their life inspirations became our design inspirations, and guiding all of our decisions was their clearly expressed desire: to raise a child who’s aware, and a little awestruck, by our planet’s amazing cultures. So it seemed only natural to begin in that child’s room, and we did…with draperies. We added the 3-foot bottom panel full of Asian influenced colors, patterns and people. Then, we moved to…fabric. The Puchin people of Columbia inspired the graphics on the chair pillow. Next up…the art, which let us weave together the story of the fabric and what was being seen on the wall. Here we created a (very enlarged) photograph of the process of making the pillow fabric. We ended our vision for this child’s room with a look upward…the ceiling. Hand-painted by a local artist, the details are whimsical, with a Moorish influence. The family’s “world room” was inspired by the phrase “if these walls could talk…” And if they could, they’d tell us stories about where this family’s been and what they’ve explored. The built-ins we designed give them very specific places to showcase collected items from their travels: artifacts, art, textiles, and books…lots of room for books…on their wide-ranging passions: wine, design, all the places they’ve visited (and all the ones they intend to in the future.) We invited the same artist who painted the child’s room, to envision the “world room.” Her challenge? Take tribal patterns and re-interpret them on the walls of this warm, cozy room--the most used of all the rooms in this 1905 Tudor house. When the family’s sitting here, the simple, everyday pleasure of seeing what they love, leads to the joy of remembering where they’ve been. And why it matters.